I feel as if I need to reintroduce myself now that I’m back from sabbatical. I hope I’ve changed since being away, and I know The Empty Inkwell will look a little different from now on too. Check out my last post or the About page for more information about changes. The day—okay, days—I found myself fighting tears as I sat down to write, I knew something wasn’t working. I had pushed myself to burnout. I’d ignored the symptoms for a long time, telling myself I didn’t have the luxury of a break. I was involved in several ongoing projects, finishing a course, and restarting a manuscript. Also, I’d just faced a stressful career decision and was still processing. When I took an honest look at where I was, I knew I couldn’t keep doing what I was. After praying, I pushed away from the desk, literally and figuratively, with no idea how long I’d be away. While I still wrote some non-fiction and met certain deadlines, I marked the rest as optional and left it at that. But, come back I did, and here are five things I learned while away. 1. Rest is essential to productivity. You can’t see too well through tears. You can’t work well when you’re exhausted. Your mind can’t cope when nothing is being poured back into it. Too busy trying to be like everyone else’s brand of professionalism, I had lost sight of some important things. When I took the self-imposed pressures off—all that I could—I saw things I’d been doing wrong and found myself putting more time into things that mattered in the long run. I wasn’t just trying to get something—anything!—done by five o’clock. Instead, I was looking long-term, aiming at quality, and keeping my focus on the big picture. 2. The perfect opportunity to rest will never come. If we can make time for responsibilities and priorities, we can make time for rest. Personally, I knew rest was essential if I didn’t want to do greater harm. The season I thought I was going to use to get a lot of writing done actually became the season God pulled me away from my manuscript and said, “Sit. Stay.” So I did. 3. Rest does not equal laziness. Rest is not the absense of work. Nor does it always look like a week off or a long vacation. Mostly, it looks like an intentional, temporary (but no less emphatic) “No” to things that are draining you. God wants us to rest. And not just when we push ourselves to burnout. 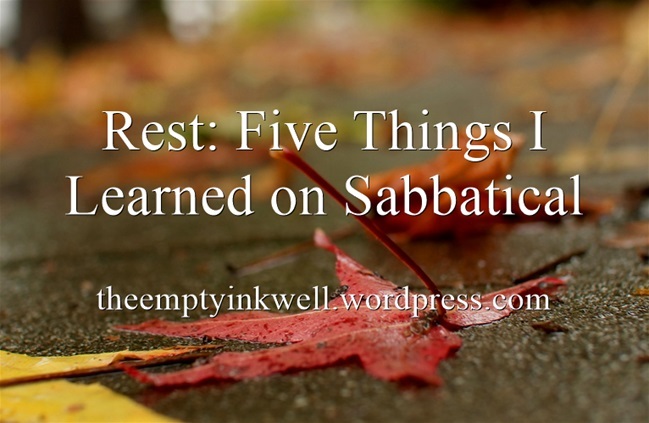 He designed us to rest daily, weekly, and seasonally. But we get to choose whether or not to unplug from what drains us and tap into what recharges us. It was hard keeping away sometimes, especially when doubt and anxiety hit. But I knew I wasn’t recovered enough and to return would mean opening a wound that wasn’t healed. 4. A mind in “out of the office” mode is more open for new ideas. If I hadn’t taken a hiatus, I probably wouldn’t have found the direction I believe God is steering me. When I could sense I was almost recovered, my excitement slowly returning, I was out for a walk. I wasn’t stressing—my mind was relaxed. That’s when my a-ha moment came. I saw why I had lost my passion for a current project and saw a solution for what I’d thought were contradictory writing passions. The answer could affect my work in progress and, quite possibly, any future manuscripts too. That’s what I call a revelation. To think—I could have missed it. Before sabbatical, I’d been so busy pushing myself toward where I thought I had to be, I never saw that I was going in the wrong direction. 5. Sabbaticals can be scary. When I burned out, I felt like a runner two-thirds of the way through a marathon. It felt so good not to be straining anymore, and I honestly didn’t know if I would get back up or call it quits. To put that statement into perspective, here’s a little imagery: I’ve been working toward being a novelist for nine years now, investing time, money, and energy into it. It’s never been a starry-eyed dream with a glimmering “someday.” It’s been the lifelong goal, passion, and calling. I do not look at it as glamorous or easy or disposable. But I’d had a glimpse ahead and saw that publication is a whole new marathon and not a finishing line. Just thinking of it made me feel winded. Sometimes rest can make or break it. I’ve found it’s best to be prepared for either, because at the end of the day, you really don’t know which one it’ll be. Do you need a rest? Is God calling you to take a step back? I can guarantee it’ll be invaluable. Taking the moment of rest is hard but recognizing the need for rest is often times harder. It’s so very important to remember God’s reminder to, “Be still.” Thanks for the reminder and I look forward to seeing what’s coming! So true, Natalie. Thank you for stopping by. Thanks for sharing your heart as to the learning process God is revealing to you. I realize you are determined and operate without flattery. If you are comfortable with Francie, I also am.